Don't miss your chance to save on N-Fab Steps with New Deal at CARiD! - Ford F150 Forums - Ford F-Series Truck Community. Don't miss your chance to save on N-Fab Steps with New Deal at CARiD! 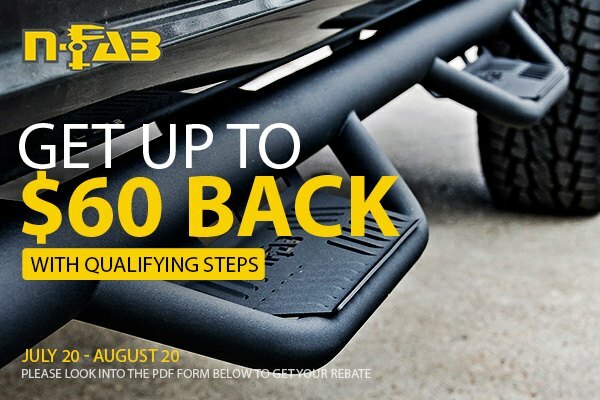 Buy qualifying N-Fab steps and get up to $60 mail in rebate. Don't hesitate any longer, the time to make your purchase is now! Offer is valid through August 20, 2018. No matter what set you choose – Podium, Wheel to Wheel or Predator, you'll not only get an easier access to your truck but also get your rocker panels protected at the same time. Constructed using superior quality steel materials, they are available in blacked powder coat or stainless steel finishes. They are durable enough to hold your weight and withstand any abuse your truck might be going through. Use an advantage of this limited time offer on N-Fab products! Please complete the PDF form and follow instructions to get your rebate. Quick Reply: Don't miss your chance to save on N-Fab Steps with New Deal at CARiD!